There are few times that comic books / graphic novels have the power to move me to tears, but in the last week I have been greatly affected by 2 pieces of work from the 1980s. 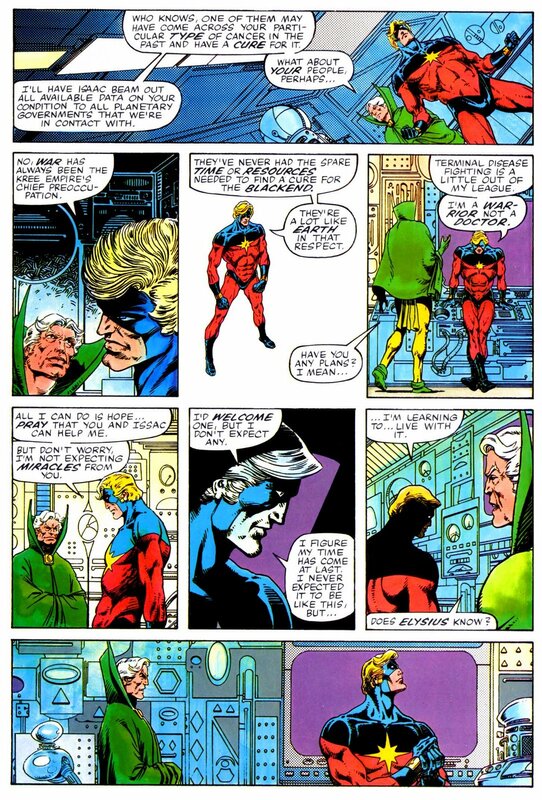 The second title I want to share with you closes the circle that began with me discussing the Miracleman Birth. 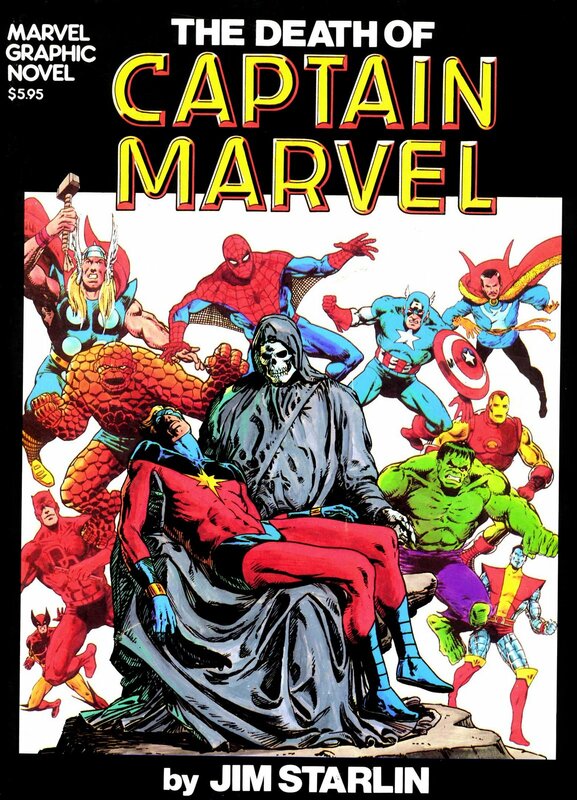 The second title is the acclaimed ‘The Death of Captain Marvel’, by Jim Starlin (who writes and illustrates). This is famous for being regarded as the first Graphic Novel, and is not daunted by being the first in the genre. It sets a standard that only the very best titles have surpassed (ie those that are rapidly becoming ‘canon’ such as ‘The Dark Knight Returns’ and ‘Watchmen’). It is important to remember that this title did not start off as a comic book, like ‘Dark Knight’ or ‘Watchmen’. The importance of this storyline meant that a book format was to do the subject matter justice. The story concerns the Death of Captain Marvel, a well known figure in the Marvel Universe, as he struggles with an adversary, the terrible and terminal ‘blackend’, that cannot be defeated like the generic ‘bad guy’ of traditional comic tales. As the disease begins to take hold of this noble Kree Warrior, there is reflection on his life as those from his past, friend and foe alike, come to pay their respects and pay tribute. This is a meditation on love and loss, on the merits of a life lived as a noble and good person, on dealing with regret and the vagaries of chance, the lottery of life and the precious resource of time. As the story solemnly and inexorably reaches the finale there is a change of tone and the book evolves and transforms into the most triumphant vindication of spirit and love for life that I find the story transcends its superhero basis and becomes something unique and moving. It leaves you both drained and exhilarated. It leaves you glad you spent the time reading this dignified and moving piece of fiction. Again, like the Birth of Miraclemans Daughter (see here) I shed tears, and felt incredibly moved by the book. 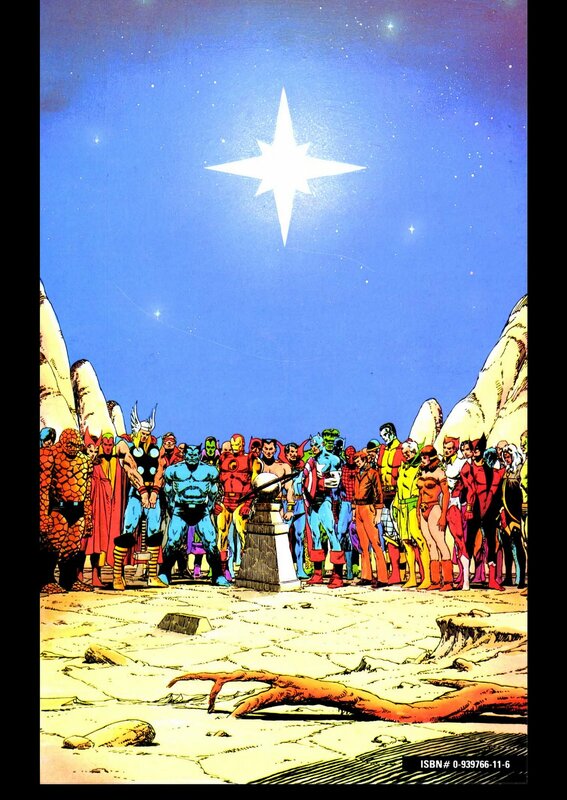 If you can bear the basic graphical style of Jim Starlin and occasionally stilted action scenes, this is really worth sticking with, and one Marvel title that has a soul and an all embracing understanding of the vitality of life and the raging against the dying of the light.